Here we have London’s reaction to his arrival. A very British protest with over 250,000 attendees. Good work, my friends, good work. Oh, I see you’re wondering what that blindingly orange blimp is? Well, this 6 metre monster is. of course, all part of the protest. 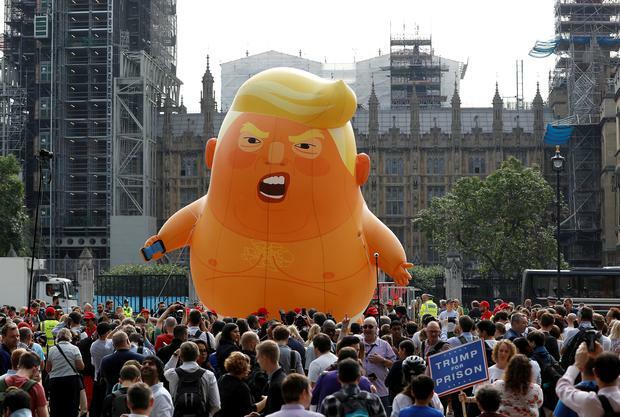 It depicts Trump as a baby, wearing a nappy and holding a mobile phone, which is a fairly accurate representation if you ask me; a seventy-year-old man who enjoys launching abuse at others through Twitter really is nothing but a child. On the subject of technology, interestingly, it has just been reported that twelve Russian Intelligent Offers have been formally accused of hacking the Democratic National Committee during the 2016 election. Seems a convenient time to skedaddle out of the country, eh? This news is very recent, so there have been little details released, but I do not believe for one second that Trump was completely oblivious to what was going on. It is simply not possible for him to have had no idea whatsoever. It really isn’t looking good for him. Not at all. 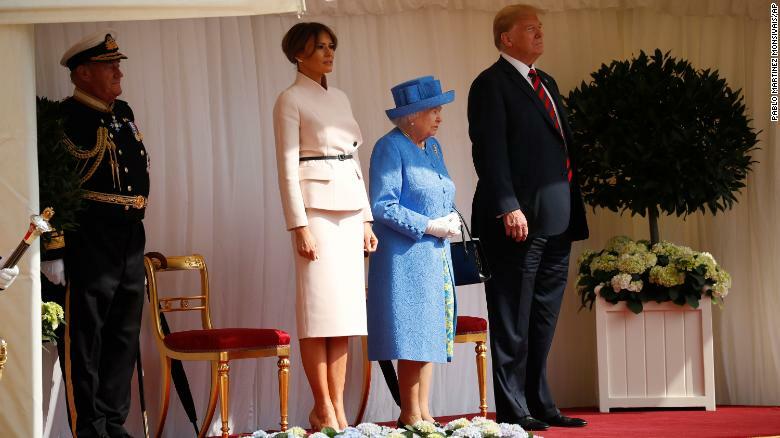 Furthermore, although there is yet to be a vast amount of footage of the Queen and Trump meeting for the first time, those of you who watched the livestream on BBC would have noticed that Trump did not allow Queen Elizabeth to lead him around the grounds, as is expected, but he, instead, chose to, at some points, lead himself or, at the very best, merely walk alongside Her Majesty. But why is this so embarrassing? Well, put simply, it is considered a necessity to walk behind the Queen upon arrival. In fact, one of the commentators for BBC stated that it was most likely that this tradition would have been the last thing good old Donnerz was reminded about, and told to strictly follow, before going to meet Her Majesty. If this seems strange to you, let me ask you a question: When visiting your friend’s house for the very first time, would you invite yourself in and proceed to poke your head around every room in the house, without even being permitted to do so? And, as if he hadn’t made enough of a mess, Donald decided that it would be a wonderful idea to slate Theresa May behind her back, to The Sun of all papers, then, once released, he would deny it all. Now, while The Sun is far from the most reliable news source in the country, one cannot give an entire interview, then deny having said anything of the sort. Especially considering there is a recording, accompanied by a transcript, to prove otherwise. Many may choose to focus on the fact Trump has spoken about our Prime Minister in such a disrespectful manner; POTUS stated that Theresa May had chosen to ignore his advice on Brexit, and had done the absolute opposite of what he’d advised, causing him to come to the conclusion that the UK’s trade deal with the US would probably not happen. While this is both discourteous and rather concerning, I believe there is a much more concerning topic at hand: Donald’s take on Boris Johnson. Please, for everybody’s sake, don’t even let this man be considered for the role of Prime Minister. It would be like having two Donalds; both in looks, and in policies. He’s such a nasty organism: a walking bucket of orange vomit. I’m sorry for everyone who has to deal with him in their country on his “World Tour.” I second @macsbooks311’s comment! Unfortunately, he’s now gone up to Scotland to play golf, so the Tower of London idea is no longer possible. However, we’ll see if any golf balls or golf clubs can mysteriously fly in his direction for you! Thanks for reading, by the way.